For many tourists trekking to Mt Everest Base Camp this autumn, the trip will be an adventure of a lifetime. The thin clear air, stark landscape, and ice-tipped peaks pierce the inky sky providing great Instagram backdrops. However, what is stunning scenery to tourists is for climate scientists an apocalyptic sight. They see dramatic evidence all around of a rapidly warming atmosphere. 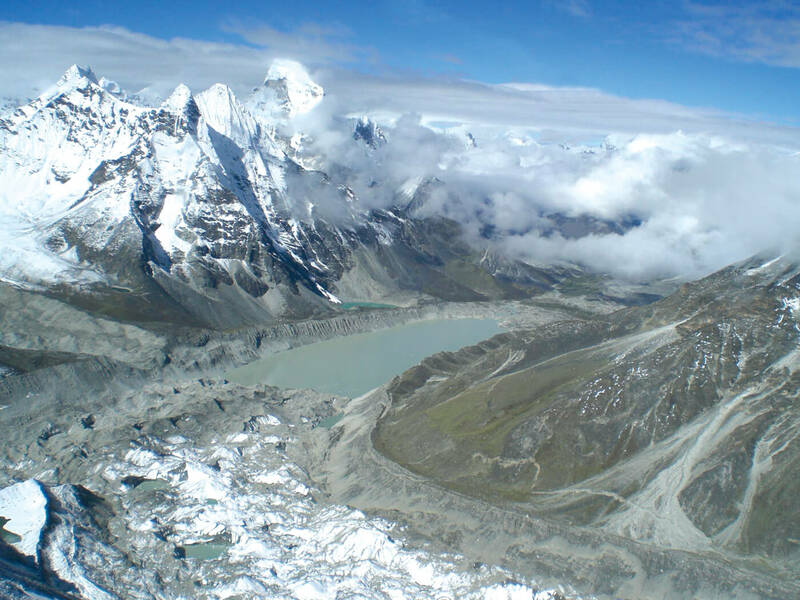 Visitors returning to the Everest region after 20 years also notice changes: large lakes where there were none, glacial ice replaced by ponds, boulders and sand, the snowline moving up the mountains, and glaciers that have receded and shrunk. All these features are visible from ground level right from the start of the trek in Lukla. The banks of the Bhote Kosi still bear the scars of the deadly flash flood in 1985 which washed off a long section of the Everest Trail and the hydropower plant in Thame. It was caused by an avalanche falling into the Dig Tso glacial lake, causing it to top over. Further up near Tengboche, the Imja Khola also bears signs of a huge glacial lake outburst flood that thundered down the western flank of Ama Dablam in 1977. And below the formidable south face of Lhotse is Imja Tso, a lake 2km long that has formed and grown in the last 30 years. It does not exist on trekking maps from the 1980s. All these lakes were formed and enlarged as a result of global warming melting the ice. The Khumbu Icefall funnels debris and ice from the Western Cwm down to the Khumbu Glacier 1,000m below. The Lobuje Icefall is now a hanging glacier, having retreated above the cliff. The terminal moraine of the Khumbu Glacier looms 400m above Dughla. 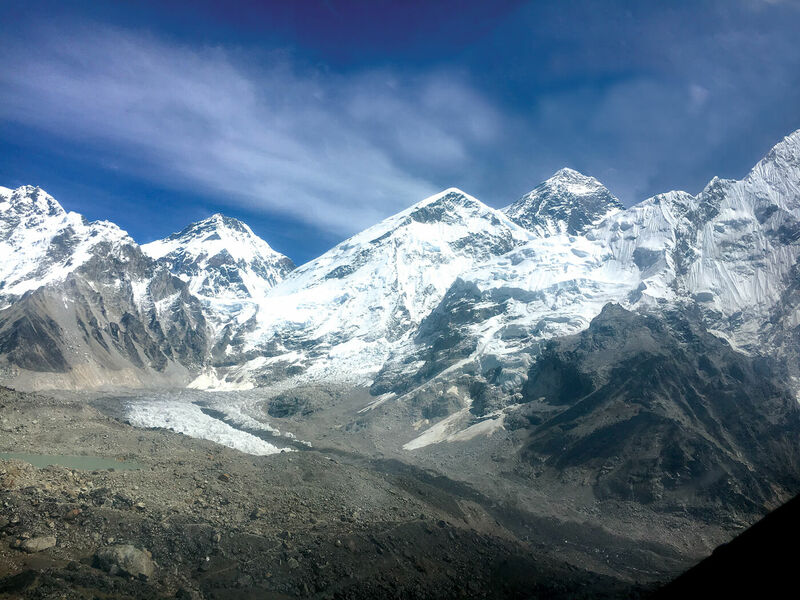 This is the debris bulldozed down from Mt Everest and surrounding peaks over millions of years, and represents the extent of the glacier’s advance in the last Ice Age. Today, the surface ice on the world’s highest glacier is all but gone due to natural and anthropogenic warming. For an even more dramatic glimpse of how global warming is changing the Himalayan landscape, there is nothing like an aerial perspective. Nepali Times got a chance last week to take these striking images of the terrain below Mt Everest. The barren beauty foretells of a time when this terrain will be stripped of much of what remains of its ice cover. Imja Tso did not exist in trekking maps 30 years ago. Today it is 2 km long and 1 km wide. Supraglacial ponds dot the debris-covered glacier. The Khumbu Icefall funnels ice from the Western Cwm below Everest, Lhotse and Nuptse to the glacier below. The ice here has receded at an average of 30m/y in the past 20 years, but it has also shrunk vertically, losing up to 50m in thickness. Everest Base Camp was at 5,330m when Hillary and Tenzing climbed Mt Everest in 1953, today it is at 5,270m. The glacier is also getting flatter: the darker debris makes the ice beneath melt faster near Base Camp, but the thicker layers of boulders and sand further down insulate the ice. Glaciologists say this flatter profile means the ice moves slower, leading to more ponding, and more rapid melting of the ice underneath. The velocity of the glacier is 70m/y at Base Camp, and it slows down to 10m/y further below, but is zero at the terminus situated at 4,900m. This means the ice is decelerating as it is squeezed, and the pressure is being released by the melting of the ice mass. 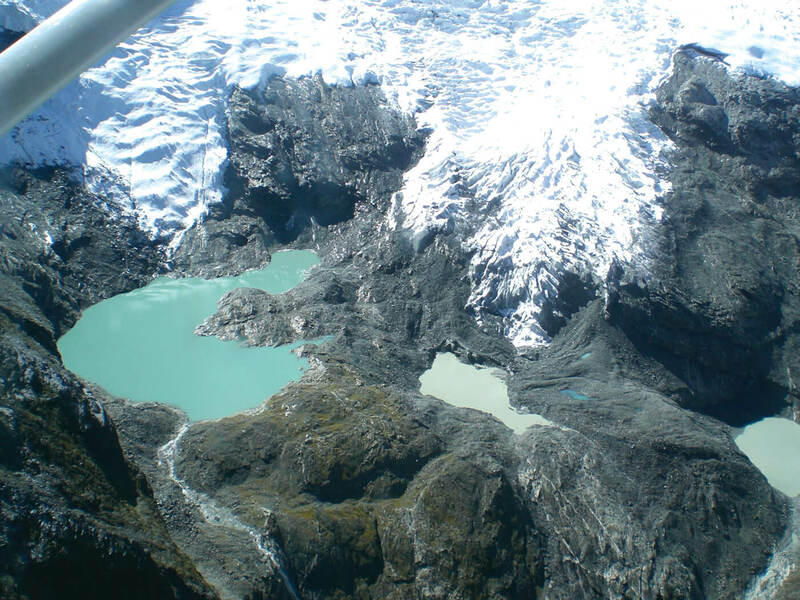 Researchers monitoring the supraglacial ponds say their area has grown by 70% in the past ten years alone. The ponds are fringed by ice cliffs and caves which accelerate the melting. 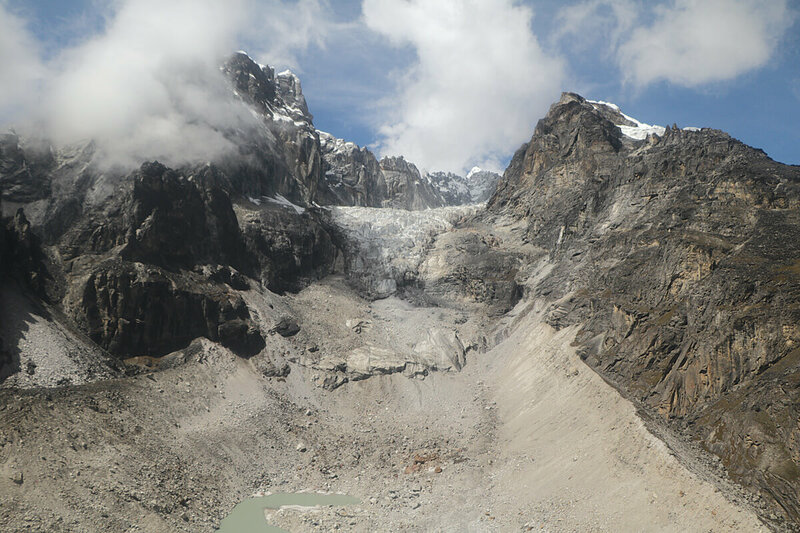 The melted ice has carved an outflow channel through the left lateral moraine, so there is no large glacial lake on the Khumbu like as elsewhere in Nepal. 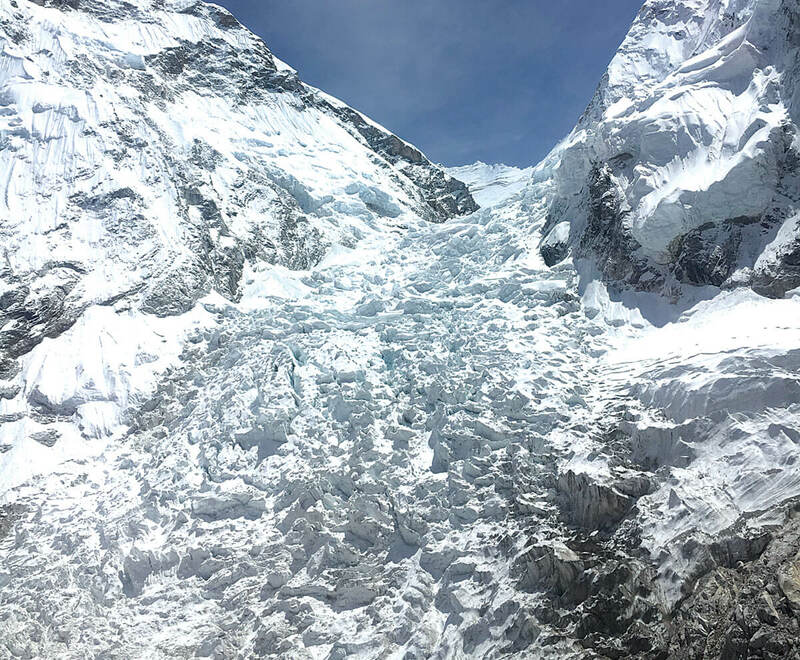 Scientists conclude that the Khumbu Glacier is not about to vanish, and the Icefall is not going to turn into a water fall any time soon. However, the permanent ice catchment of the glacier above 6,000 could start to deplete under the worst-case ‘beyond catastrophic’ scenario of +5°C warming. Will more tourists visiting areas threatened by global warming spread awareness and help save the planet, or will the energy they burn contribute to making the earth warmer? Both. Tour operators offer Antarctic cruises, trips to Greenland and the Arctic to observe calving glaciers up close. Many have scientists on board instead of tour guides, and the travel companies say the trips help spread environmental awareness. However, mass tourism also comes with its own enlarged carbon footprint and the very act of visiting the Himalaya to see melting glaciers may contribute to thawing them faster. The carbon emitted by a holiday charter plane to the Maldives, for example, leads to sea level rise that may ultimately submerge the archipelago nation by the end of the century. However, as awareness grows about the effects of global warming in the poles and the ‘Third Pole’ (as the Himalaya is called) there is also increasing interest among the public to see up close the impact of climate change on the mountains. Many trekkers visiting Nepal are eco-conscious and aware that their travel and stay in Nepal comes with a carbon cost. As they share their impressions on social media, there is evidence that climate tourism can indeed turn many visitors into environmental activists, or at least convince them to lead less carbon-intensive lifestyles when they get back home. 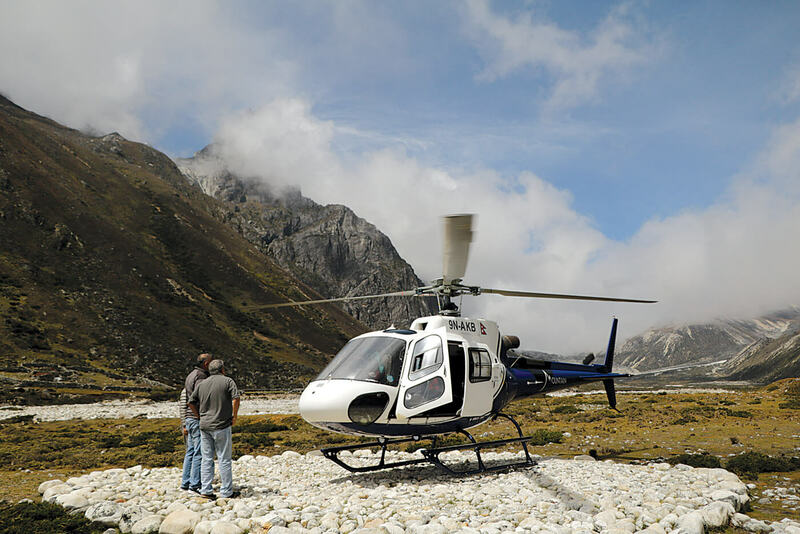 Many environmentally sensitive visitors to Nepal these days calculate their carbon footprint from the aviation fuel per passenger on their flights to Kathmandu and Lukla, in taxi rides, and even the carbon emitted by the LPG gas in lodges along the Everest trail. And they try to offset all that by donating to agencies working on adaptation or mitigation of climate impact. Even so, there are critics of carbon offsetting who say that it is cosmetic and does not address the wasteful consumerism that is at the root of the climate crisis. They say trekkers on Everest hikes who buy carbon offsets are simply washing off their guilt, and shifting the responsibility to do something about global warming on someone else. 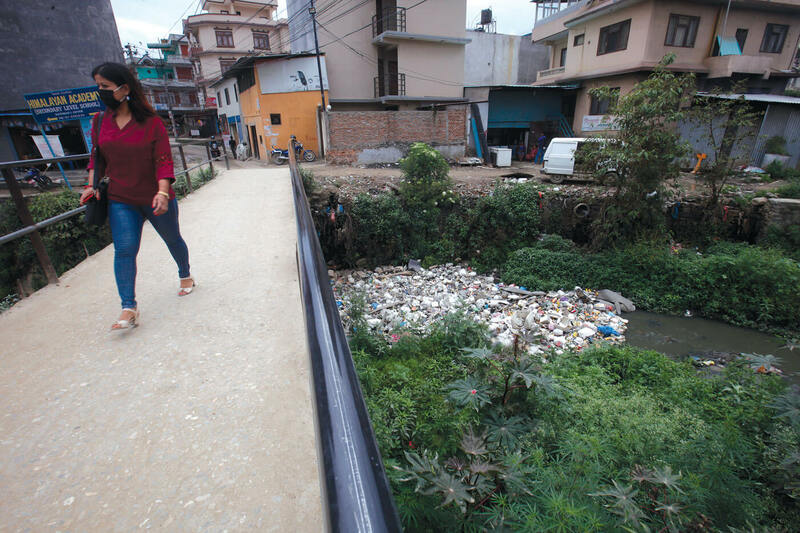 On balance, however, there is a case to be made for climate eco-tourism creating jobs and benefitting the Nepal economy, ultimately allowing the tourism industry to introduce less carbon intensive technology. Tourists from all over the world can also see for themselves how the people suffering the most from the effects of climate change are the ones least responsible for it. There are websites to calculate your carbon footprint and how to offset the cost to the climate of your tour. 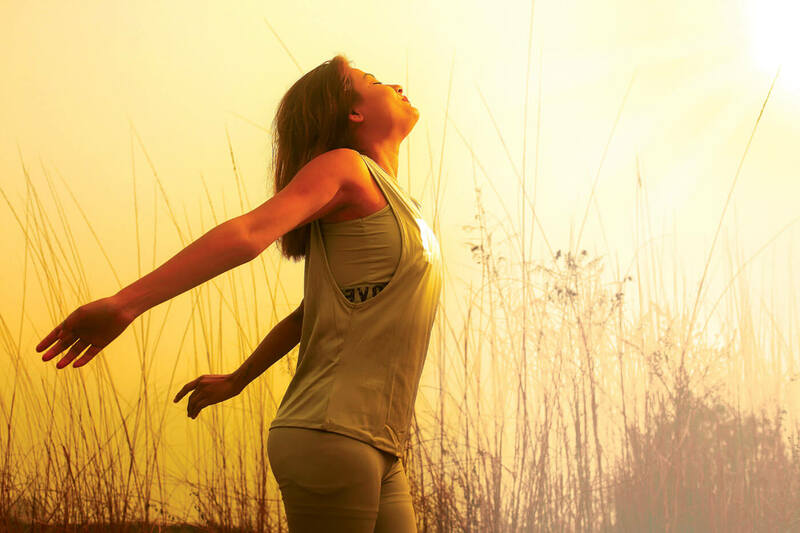 There are also trekking agencies and airlines that try to minimise their carbon footprints. HOW MUCH CO2 DID YOU BURN TO GET HERE? An economy class roundtrip passenger on a flight from London Heathrow to Lukla via Kathmandu emits 2.9 tons of carbon. The emission can be offset by contributing to verified climate protection projects that do not just contribute to reducing greenhouse gases and creating carbon sinks through forestry, but also for sustainable development.